Snaffles (Charlie Johnson Payne) (1884-1967). Lithograph remarques and signed "Saffles 17" lower right; signed also in original hand lower left. The colour part of this picture is hand painted..
A beautifully executed painting enhanced by the fact that the colour element is hand painted and with body colour added for the steam escaping from the sirens on no. 2 funnel of this torpedo boat destroyer. It’s a filthy day, blowing a stinker and raw and cold too: the figure on the bridge wing with megaphone is togged up in his oilskins, souwester and leather gloves and is clearly trying to get some recalcitrant merchantman to get into formation as his ship rolls and plunges in the unpleasant sea. The remarques in the borders show the captain or officer of the watch (probably the former judging by his girth and weather beaten face!) 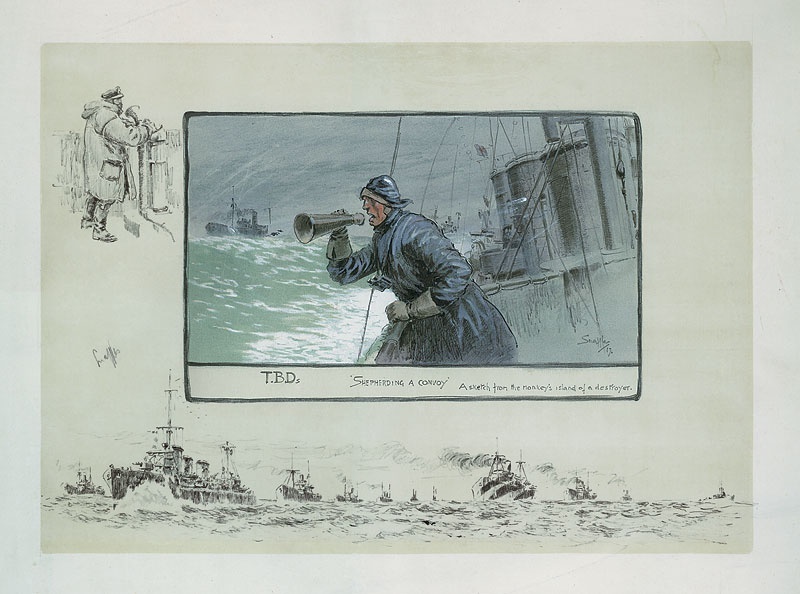 in duffle coat and sea boots at the binnacle; and in the lower margin a destroyer patrolling the convoy on a slightly more pleasant day with more moderate sea and wind.